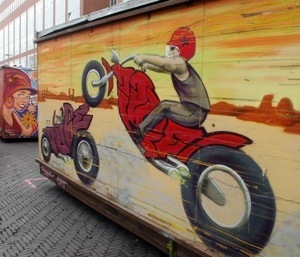 Netherlandgraffiti: a Moto themed tag on the side of a box van in one of the street markets of Amsterdam. I can’t fully read the artists tag but it looks like ¡DiCe! A perfect machine! Elegant in line, simple in function, pure in balance. The safety bicycle from over a century ago still looks unimprovable today. This Dutch example locked to a canal railing defines that design. The swooping frame line mirrors the wheels hoops. it’s ready to roll on the cobbled streets to work, on an errand or just cruising the back lanes. Now If we can just find a way of attaching a motor…. There’s a thought! Utrecht, The Netherlands: spied in an windswept shopping center on the fringes of that beautiful dutch city this ‘ute looks like it would tote all your wares, tools, kids whatever around town. This practical two-stroke truck just needs a boiler suited rider ready to get on with their job at hand. 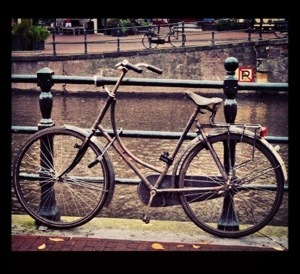 The ubiquitous dutch cyclist rides a plain black ‘sit-up-and-beg’ bike, usually slowed by a back-pedal brake. A healthy and efficient way to get about. Especially when the only hill is the occasional bump over a canal! Utrecht is a beautiful city perched along a picturesque canal. A bicycle is a good speed to dawdle around here at the speed of the water easing through this idyllic setting. It was here that we saw a unique bike that would be sure to turn heads: a wooden framed item, complete with finely sanded frame, adjustable seat height and wooden mudguards. Velo du bois! 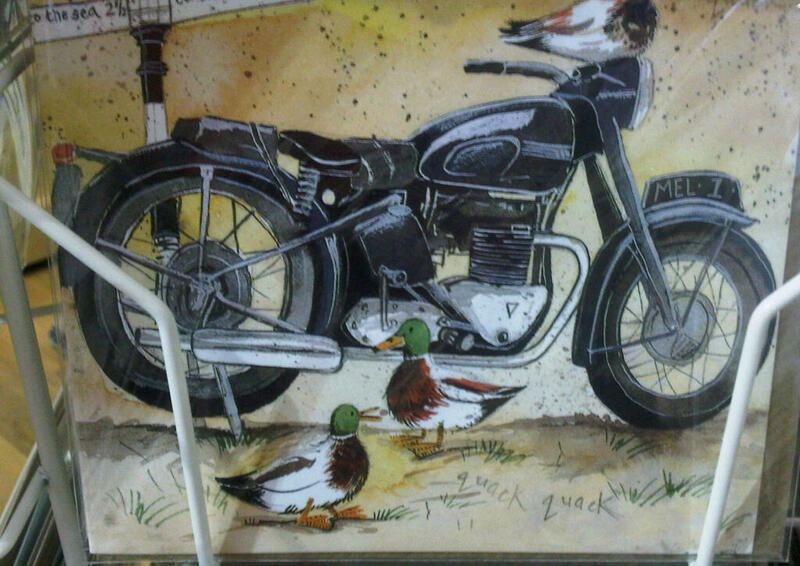 Just back from vacation to Blighty… While I get back to some semblance of order here’s a moto-card I saw: an ink line watercoloured Triumph Thunderbird. Duck!